Being surprised by a giant fish where you didn’t expect one is always a blast. I was fishing a local river with my friend Joe, trying to catch big fall brown trout on streamers and nymphs. The river in question (which shall remain nameless) definitely holds some beasties in the 25-inch range, but we mostly catch browns in the 16- to 20-inch class, which is still good-size for northern New England. What we don’t catch are rainbows. So imagine my surprise when I laid into something heavy in a deep pool under a highway bridge, only to see a slab of green, pink, and white when the fish rolled near the surface. After a few long runs, the fish came to hand. Based on the health of the fish and its perfectly formed fins, we concluded that it was, in fact, a wild fish. Where it came from, we couldn’t even guess. ok so the river shall remain nameles… but what about that nymph in the fishes mouth?!?! 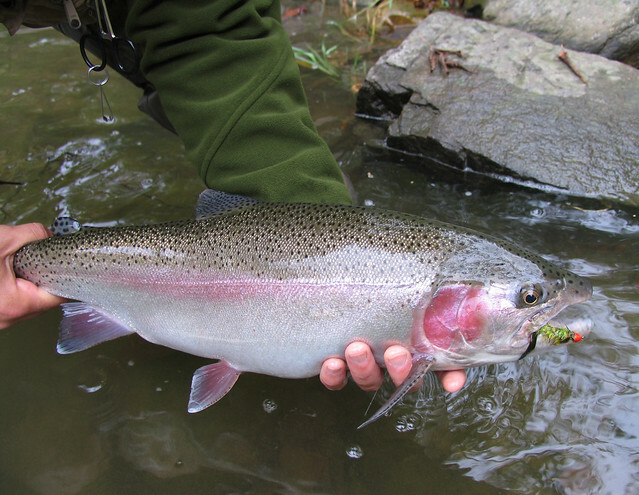 Dude, you could have told me that was a steelhead and I would have believed you. Awesome colors on that one. Nice Job dude!